It's already Week 4, and that means some 0-3 or 1-2 fantasy teams may begin to panic. But we all know that leagues can be won through the waiver wire, so don't go too crazy just yet. Besides QB Jimmy Garoppolo, Week 3 saw few injuries. It was another QB and WR heavy week according to stats, and that means the waiver wire will see a lot of bids for some emerging wide receivers. Here are some guys to look at this week on the waiver wire. 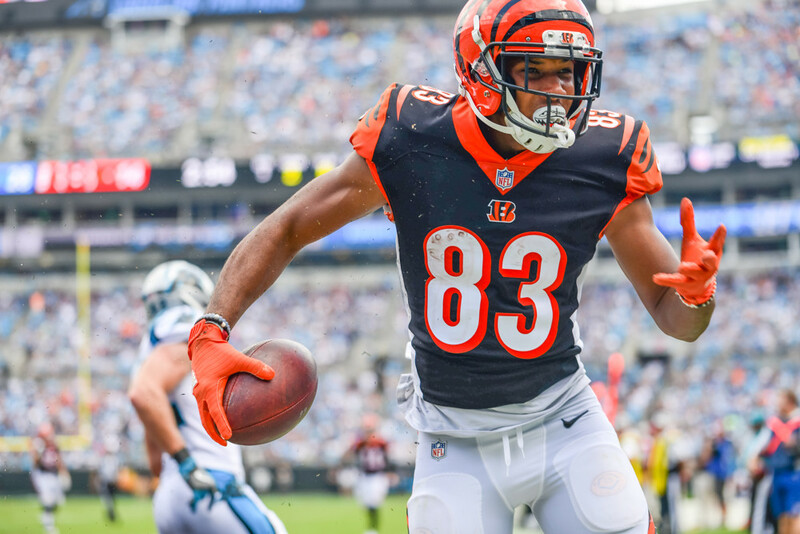 Even though it was WR John Ross that was receiving all the hype this offseason, WR Tyler Boyd is the one actually doing things in Cincinnati. In the last two weeks, Boyd has 12 receptions (16 targets) for 223 yards and two touchdowns. It seems like third year WR is primed for a breakout. What's even nicer is that Boyd gets a soft schedule in the next 5 weeks. Cincinnati plays Atlanta, Miami, Pittsburgh, Kansas City, and Tampa Bay before their bye. Boyd can be added in all leagues. Geronimo Allison only moved up 3% in ownership last week, so we are going to keep hammering the point home. Now he didn't have a ton of targets in Week 3 against the Redskins, but Allison made the most out of it, catching 2 passes for 76 yards and 1 touchdown. If you watched the game, you probably noticed Josh Norman was usually covering Allison, so don't be upset that he didn't get a ton of targets. The Packers get the Bills, Lions, and 49ers before their bye week, so Allison should have more productive days ahead. He should be added in all leagues, especially with Cobb seemingly dropping off a cliff recently. Javorius Allen is another name that's been on this list for a few weeks, but his ownership percentage is still criminally low. Now I get ithe isn't flashy. He rushed 6 times for 7 yards and 1 touchdown against the Broncos. He also caught 3 passes for only 19 yards, but added a 2nd touchdown to his day. Allen is 100% the goal line back, scoring a touchdown in every game thus far. So far in 2 of 3 games the Ravens have been well ahead of their opponents, which makes it understandable why Allen is not getting a ton of targets. He should be added in 12 team leagues. Expect his targets to increase as the Ravens play in closer games. Calvin Ridley looked like he would be in for a bad year after the first game, where he caught 0 passes on 2 targets. But over the past two weeks Ridley has exploded for 210 yards and 4 touchdowns. He constantly burned the Saints' defenders last week. With QB Matt Ryan playing almost as good as his MVP season a few years ago, Ridley should continue to see a ton of targets. He gets the Bengals, Steelers, and Buccaneers the next three weeks, so he should have a pretty decent shot at great games. He should be added in 12 team leagues. Antonio Callaway had his first opportunity to play without WR Josh Gordon hanging around, and he became the 2nd most targeted player on the Browns. Now he only caught 4 passes for 20 yards, but he was targeted 10 times, which is promising. The Browns have their best start in many years at 1-1-1, and now have QB Baker Mayfield at the helm. Callaway could quickly become a huge playmaker for the Browns, especially with Mayfield looking as good as he did against the Jets. Callaway should be added in 12-14 team leagues. Christian Kirk is more of a speculative add this week, mostly depending on who starts at QB from here on out. QB Josh Rosen got his first chance at playing this past week, and even though it was a small sample size, Kirk was his favorite target. Kirk finished with 7 receptions on 8 targets for 90 yards. With the Cardinals reeling at 0-3, they may need to switch things up on offense. Kirk can be added in 14 team leagues for now. Speaking of the Browns, QB Baker Mayfield looked sharp in his first ever regular season play, completing 17 of 23 attempts for 201 yards. Mayfield came in after Tyrod Taylor left with a concussion, and he most likely has won the starting job from here on out. He led the Browns to their first win since December of 2016, and looks to continue the success next week against a beatable Oakland team. With weapons such as WR Jarvis Landry and Antonio Callaway, and TE David Njoku, Mayfield could be a nice streaming option going forward. I guess you can say I'm firmly on the Cleveland train. The Browns had their third solid outing in a row, holding the Jets to 17 points and recording 2 sacks, 2 interceptions, and 1 fumble recovery. The Browns now have 9 sacks and 11 turnovers in the first three weeks, and face a 0-3 Oakland team that hasn't scored more than 20 points this season. The Browns could be the biggest surprise in 2018.